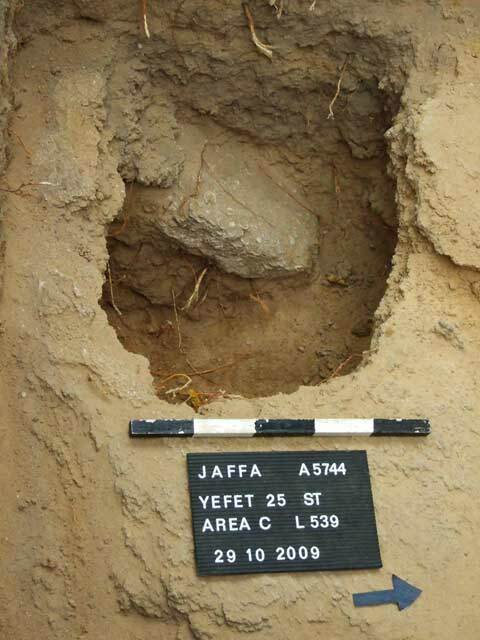 In October–November 2009 and June 2014, salvage excavations were conducted at the French School on 27 Yefet Street in Yafo (Permit Nos. A-5744, A-7142; map ref. 176820–85/662114–80; Figs. 1, 2), prior to converting the structure to a hotel. 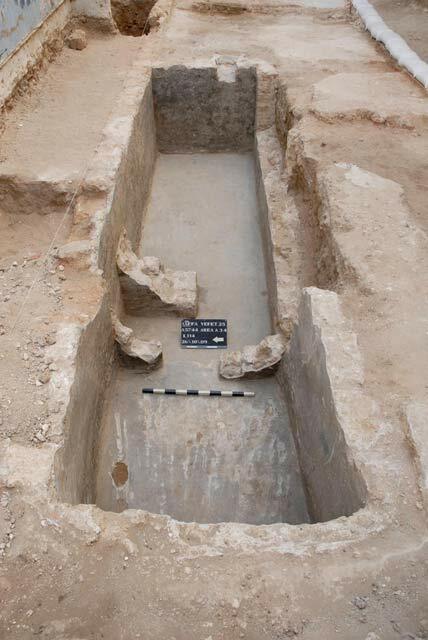 The excavations, undertaken on behalf of the Israel Antiquities Authority and financed by the RFR Israel Company, Ltd., were directed by L. Talmi and Y. Arbel (field photography), with the assistance of L. Rauchberger and A. Dagot (area supervision), S. Yaʽakov-Jam and Y. Amrani (administration), T. Sagiv (field photography), M. Kunin and A. Hajian (surveying and drafting), A. Ashkenazi (field registration), C. Ben-Ari and A. Dagot (GPS), A. de Vincenz (Ottoman pottery), E.J. Stern (Crusader pottery), P. Spivak (flint tools), B. Ouahnouna (glass), R. Kool (numismatics), A. Glick (cannon balls), V. Nosikovsky (metallurgical laboratory), Y. Nagar (physical anthropology), N. Marom (archaeozoology), I. Ktalav (mollusks), C. Amit (studio photography) and D. Barkan. 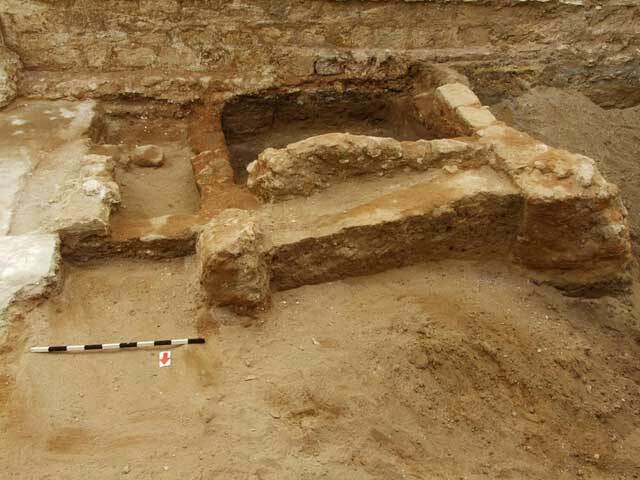 Four excavation areas were opened in the French School (Fig. 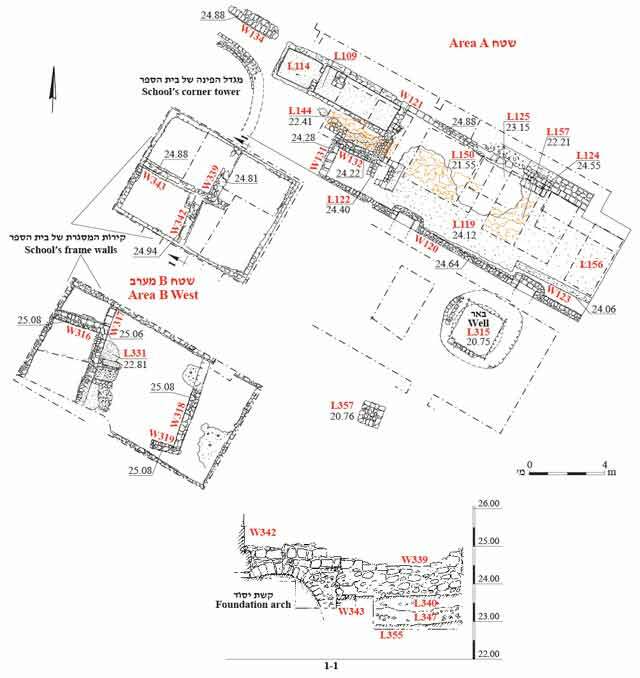 3)—in a narrow courtyard to the north (Area A), below the rooms and the sports hall (Areas B East and B West), and in the southern courtyard (Area C)—yielding remains from the Crusader and late Ottoman periods alongside burial remains. 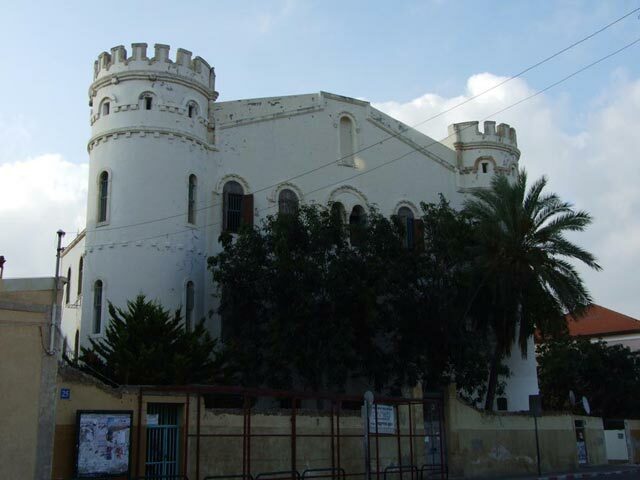 The school was established by the Catholic Order of St. Joseph in the 1880s, when the Ottoman city wall was dismantled and the city expanded into new areas, as the involvement of European powers in Palestine in general and in Yafo in particular grew (Kark 1990:36–38). 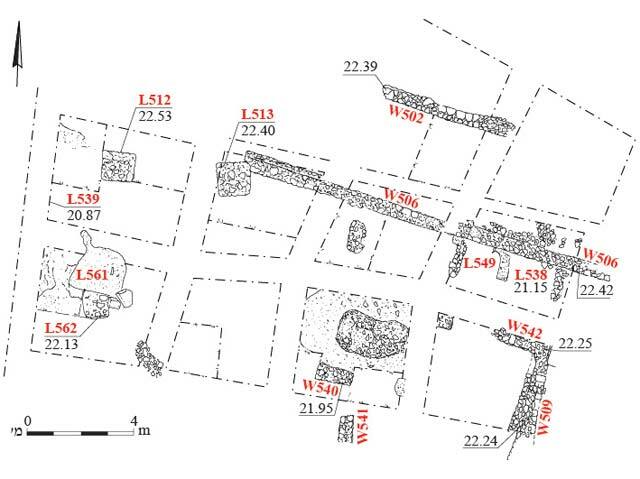 The site of the school was never excavated previously, but nearby sites—the French Hospital complex (Re’em 2010; Fig. 1:1), Yehuda Me-Raguza Street (Arbel and Rauchberger 2015b; Fig. 1:2, 3) and Andromeda Hill (Avner-Levy 1998; Fig. 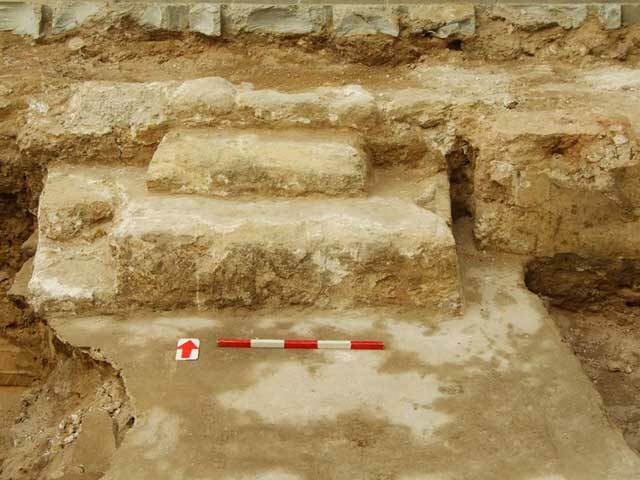 1:4)—indicate that the area was part of the southern burial ground of ​​Yafo during the Late Bronze, Persian, Roman and Byzantine periods, and was incorporated into Yafo’s agricultural area ​​in the late Ottoman period. Area A (Fig. 4). A large, well-preserved concentration of pottery sherds dating mainly from the thirteenth century CE was discovered right above the bedrock. Their fine state of preservation and date suggest that the sherds were brought to the site when a pit or channel was intentionally filled with soil and refuse. The proximity to the fortifications that were exposed in the nearby French hospital raises the possibility that this was a section of the Crusader-period moat that was blocked following the Mamluk conquest in 1268 CE. Area B West (Fig. 4) yielded a pillar used to support arches or vaults (L314). Area C (Fig. 5) yielded three pillars that supported arches or vaults (L512, L513, L528; Fig. 6). The pillars were built of dressed kurkar stones and were reinforced with cement. Their location did not fit into any clear architectural plan. Similar pillars were discovered in a well-defined Crusader context in ʽAkko (Stern and Porat 2014) and were recently identified in Caesarea (U. ʽAd, pers. comm.). Next to Pillar 528 were the remains of an earthen floor that was founded on shells (L561), a technique characteristic of Crusader-period floors in Yafo. 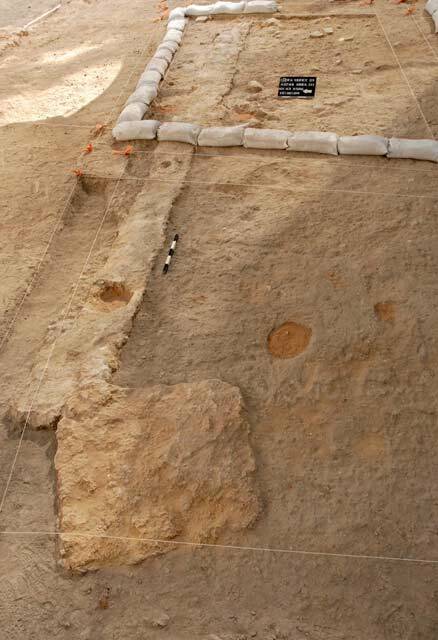 Numerous potsherds from the twelfth and thirteenth centuries CE and arrowheads from the Crusader period were found in the layers associated with the pillars. Most of the sherds were extremely abraded, evidence of their prolonged exposure before being covered with soil. A similar phenomenon was discerned in the animal bones from these strata (below). Area A (Fig. 4). A large water reservoir comprising an extensive plastered surface (L119) and steps that descended into it from the north (L124; Fig. 7) was exposed. A plastered pool (L109, L114; depth c. 0.7 m; Fig. 8) and part of a building (W122, W131, W132; Fig. 9) were also revealed. The reservoir and the pool may have belonged to a water pumping and distribution complex, parts of which were discovered in Areas B East and B West (below). The reservoir was blocked with an earthen fill when the school was constructed. The fill contained fragments of vessels and roof tiles dating from the late Ottoman period, fragments of glass and ceramic bottles, the end of a shabariya scabbard made of copper or bronze, a coin of Sultan ‘Abdul Hamid II (1876–1909 CE; IAA 838279) and a coin of the Austro-Hungarian emperor Franz Josef (1848–1916 CE; IAA 838280). 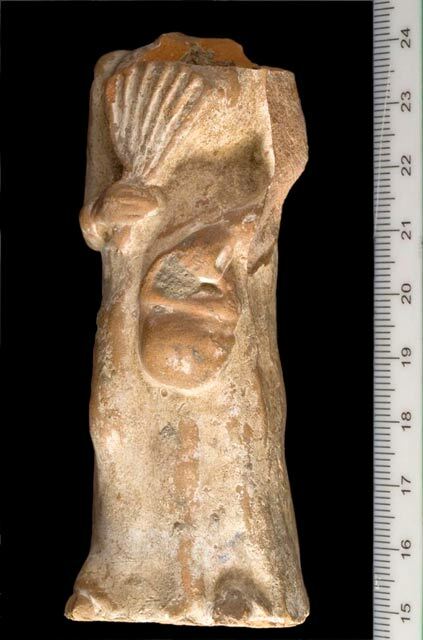 A unique figurine of a robed woman holding some type of basket was also discovered (Fig. 10). Despite the prevalence of clay figurines in Yafo during the Hellenistic period, the style and stratigraphic connection of this figurine indicate that it was from the end of the Ottoman period. Area B East. A curved section of a plastered irrigation channel was exposed. Similar channels are very common in Ottoman-period strata in Yafo (Peilstöcker el al. 2006; Arbel and Rauchberger 2015a; Arbel and Rauchberger 2015b). Pottery from the late Ottoman period and a coin of Sultan ‘Abdul ‘Aziz (1861–1875 CE; IAA 838281) were exposed in the stratum in which the channel was discovered. Area B West (Fig. 4). A well (L315; depth c. 20 m) lined with dressed kurkar stones was exposed. Remnants of a motorized pumping mechanism, the likes of which were previously found in Yafo (Rauchberger 2012; Arbel and Rauchberger 2015a), remained at the top of the well. The channel exposed in Area B East was probably connected to the well. 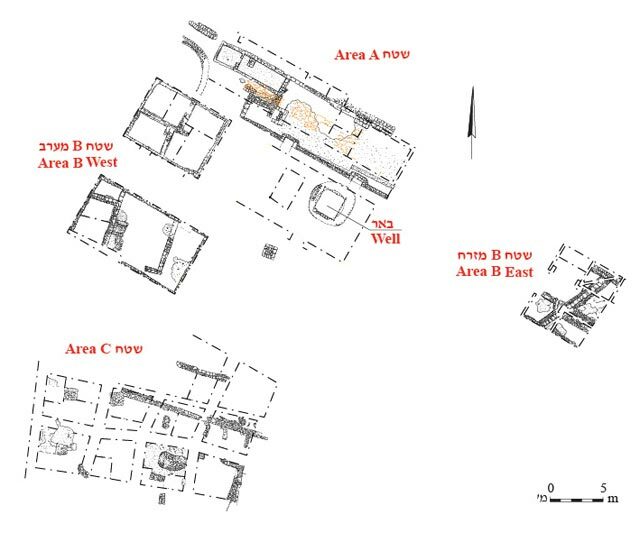 Seven walls (W316–W319, W339, W342, W343) belonging to a single building complex were discovered below the floors of the school. Beneath the walls were foundation arches (Fig. 11). Numerous pottery sherds dating from the late Ottoman period—including porcelain vessels imported from Europe—were found in the strata associated with the walls. 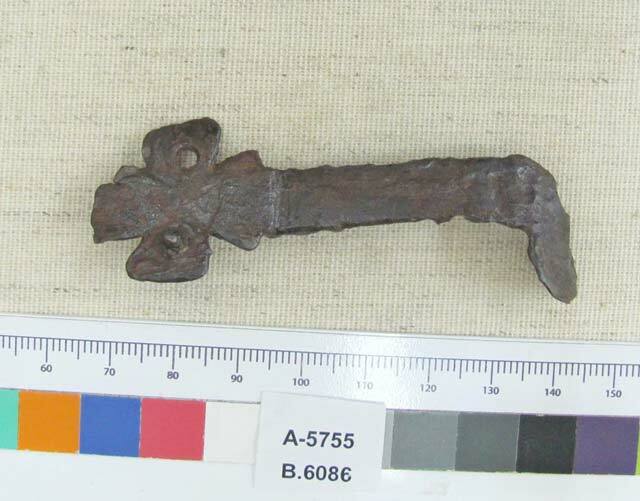 An iron item, whose end was decorated with a cross, possibly a key (Fig. 12), and two worked flints from a firing mechanism of a musket were also found. It seems that the construction in the area was dismantled when the school was built. Area C (Fig. 5). Fragmentary building remains (Fig. 6), a silver coin of ‘Abdul Hamid II that was minted in 1897/8 CE (IAA 838278) and a fragment of a cross made of shell (below) were found above the Crusader pillars. Area B. Several human bones were discovered in an earthen fill. Area C. Two tombs (L539, L549; Figs. 5, 13) that contained several non-articulated bones were discovered. The tombs were probably part of the cemetery that was exposed in the past on nearby Andromeda Hill (Avner-Levy 1998). The poor preservation of the tombs and the absence of finds make it impossible to date the remains with precision. 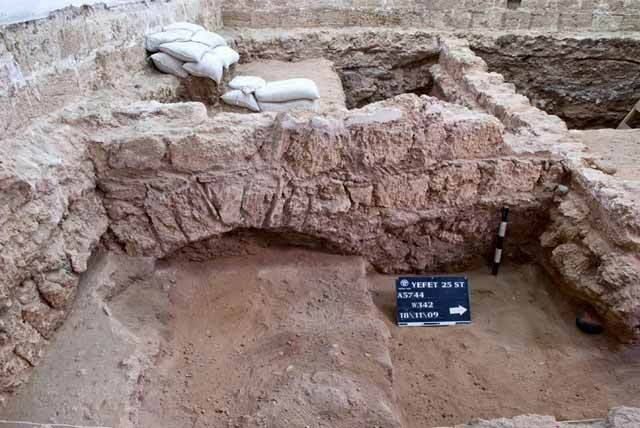 The remains exposed in the excavation indicate that there was activity related to construction and transportation of large quantities of soil during the Crusader period. The purpose and context of this activity are unclear. Remains from the late Ottoman period, including installations for pumping, controlling and distributing water, alongside typical structures, are indicative of a well-house, one of the many known in Yafo’s citrus groves, agricultural plots and orchards during the nineteenth century CE (Kark 1990:242). 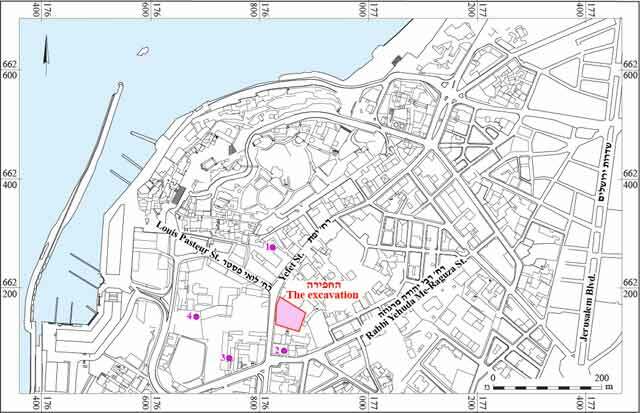 The demolition of the well-house prior to constructing a European church-run educational complex is consistent with the historical development of the city of Yafo during this period. A total of 158 bones were identified. The majority date from the Crusader period (N=110), and several are from the late Ottoman period. The decay patterns on the bones indicate that some of them remained exposed on the surface for a long period pf time before their burial, whereas others were buried shortly after they were discarded. The bones’ fracture patterns indicate a complex history of deposition. Some fractures resulted from the activity of humans and predators while the bones were still fresh, and others were caused by later taphonomic processes, which occurred after the bones had dried. The bone assemblage from the Crusader period consisted mainly of cattle (N=53, 48%), pig (N=24, 21%) and sheep/goat (N=21, 19%) bones; both sheep and goat bones were identified. Equidae bones (N=13, 12%), including the teeth of a donkey and a horse’s metacarpal, were also found, as well as chicken bones, including three leg bones, and a dog’s tibia. The bones from the late Ottoman period yielded fewer cattle bones (N=13, 27%) and more sheep/goat bones (N=22, 46%); two of the sheep/goat bones belong to sheep. This assemblage also included pig bones (N=6, 13%), including at least one rear lower molar of a large wild pig, donkey and horse bones, five wing and leg bones of chickens and one camel digit. The differences in the composition of species that make up the assemblages of the two periods are statistically significant (χ2=13.06, P=0.004) and do not appear to result from the sample size. The cattle, sheep/goat, pigs and equidae in the assemblage from the Crusader period are represented by bones from all parts of the skeleton, whereas in the late Ottoman period assemblage the cattle are represented by more butchering waste (feet and heads) and the sheep/goat are represented by meat bearing parts (parts of the limbs). The percentage of bones belonging to young individuals was high in the Crusader period assemblage (sheep/goat—45%, cattle—19%, pigs—84%) and significantly lower in the assemblage from the late Ottoman period (sheep/goat—11%, cattle—10%, pig—33%). This may be due to the more intensive production of milk, from both cows and sheep/goats, during the Crusader period, resulting in a surplus of lambs, kids and calves for the meat market. In both periods, the equidae are represented by the bones of adult individuals, except for one fetal bone from the late Ottoman period. Butchering marks made with knives and cleavers appear on many of the bones in the assemblage (N=32), indicating that meat was cut up and removed from the bones and that bones were broken so as to remove the marrow. It is interesting to note that butchering signs on an equine bone (a fetal humerus) and on a pig bone were found in a late Ottoman-period context. This suggests that the people who consumed the meat belonged to a social group that was not concerned with taboos about eating the flesh of these animals (e.g., immigrants from North Africa; Simoons 1994:341). In addition to the butchering marks, the assemblage contained a perforated metatarsal bone incised with many grooves that formed a V-shaped pattern on its surface. It may have been used as a bone anvil (Davis and Moreno-García 2007). Remains of 76 mollusks were found. They were collected by hand and identified according to their species classification. Of These, 50 are from the Crusader period, 24 are from the late Ottoman period and 2 are from mixed strata. Most of the finds are Mediterranean shells (N=61), as would one expect at a site along the Mediterranean coast. One mussel shell (Chambardia rubens), discovered next to the foundation of a pillar from the Crusader period, originated in ​​the Nile River region, and is thus indicative of ties with that region. Two species of indigenous land snails (N=11), which are part of the site’s natural environment, were also discovered. In the floors and earthen layers from the Crusader period were eight specimens of another snail species (Rumina decollate), which is not indigenous to Israel and probably arrived with the Romans as an intruder species. Three colonies of this species of snails were discovered at Apollonia, Sidni ‘Ali and Caesarea, and were dated to the Roman period. The discovery of this species in Yafo is indicative of another ancient colony. Today there are two living colonies of this species: one in the garden of the Terra Santa Monastery in Jerusalem and the other in Ramat Aviv (Mienis 2003). Four unworked shells of the Mediterranean species of the dirty cowry (Erosaria spurca) were discovered in the floors from the both the Crusader and the late Ottoman periods. Such items are used as amulets in many cultural contexts, but it is uncertain whether they were used for that purpose here. A fragment of a cross made of mother-of-pearl is noteworthy. It was made from a shell that comes from the Red Sea (Pinctada margaretifera) and was found in soil accumulations that contained artifacts from both the Crusader and the late Ottoman periods. Shells from the Indo-Pacific Ocean and two fragments of freshwater shells whose species classification was not identified were also discovered. Arbel Y. and Rauchberger L. 2015a. Yafo, Magen Avraham Compound. HA-ESI 127. Arbel Y. and Rauchberger L. 2015b. Yafo, Rabbi Yehuda Me-Raguza Street. HA-ESI 127. Avner-Levy R. 1998. Yafo, Yefet Street. HA-ESI 18:55–56. Davis S.J.M. and Moreno-García M. 2007. Of Metapodials, Measurements and Music – Eight Years of Miscellaneous Zooarchaeological Discoveries at the IPA, Lisbon. O Arqueólogo Português 25:9–167. Mienis H.K. 2003. A New Colony of Ruminasaharica Discovered in Israel. Tentacle 11:11. Rauchberger L. 2012. Yafo, Ganor Compound. HA-ESI 124. Re’em A. 2010. Yafo, the French Hospital, 2007–2008. HA-ESI 122. Simoons F.J. 1994. Eat Not this Flesh: Food Avoidances from Prehistory to the Present. Wisconsin. Stern E. and Porat L. 2014. ʽAkko. HA-ESI 126. 2. The French School, looking southeast. 4. Areas A and B West, plan and section. 6. Pillar 513 and remains of a wall from the Ottoman period, looking east. 7. The steps of the water reservoir, looking north. 8. Plastered pool, looking east. 9. Remains of a building, looking south. 10. Figurine of a woman. 11. A foundation arch beneath W342, looking west. 13. Tomb 539, looking west.